Ontario plans to sell marijuana in as many as 150 stores run by the province's liquor control board after the federal government legalizes its recreational use next summer. The City of Toronto has fast tracked the opening of three supervised safe injection sites, and at least one interim site has already opened. As Dan Karpenchuk reports, the time line appears to have been ramped up after a harm reduction group opened its own supervised injection site in response to the opioid crisis. WBFO Canada Correspondent Dan Karpenchuk reports. The Ontario Society for the Prevention of Cruelty to Animals said it is surprised and extremely disappointed to hear that all animal cruelty charges have been dropped against the Marineland amusement park. Thousands of migrants are fleeing the United States for Canada via a remote back road in Upstate New York. Ontario's premier has drawn sharp criticism over her recent announcement to significantly increase the minimum wage in the province. Some business leaders and political opponents say the move is nothing more than electioneering. Big changes are coming to Casino Niagara. Niagara Casinos President Richard Taylor says a $7 million renovation is underway that will deliver what he calls an elevated gaming and entertainment experience for visitors. Canadian Prime Minister Justin Trudeau is spending Monday morning in Ontario's Niagara region. 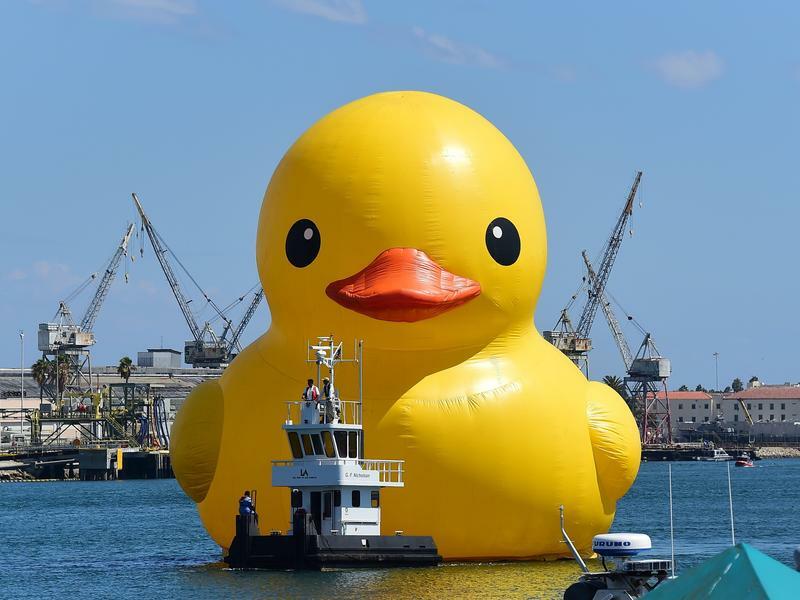 This is the story of a 61-foot-tall duck that is being called a counterfeit of a different giant duck, which itself is a replica of a beloved bath toy. Got that? Here we go. Ontario premier Kathleen Wynne recently announced a high-speed rail link from Toronto to Windsor. The issue has been talked about for decades, but previous governments had backed away because of the high costs. Two Toronto law firms have launched a Canada-wide class-action lawsuit against the manufacturers of implantable defibrillators that can fail with little or no warning because of potentially defective batteries. A Niagara area man is working to make a Lake Ontario express service a reality, one that would benefit the environment and commuters. He is pitching a plan for a hovercraft service between Niagara-on-the-Lake and Toronto. A pilot project in Ontario could have big implications for the social welfare system. Three cities, including Hamilton, will begin an experiment providing a basic income for low-income residents. Cross-border travelers have more than Canada's sesquicentennial to celebrate this summer. Canada's history is going to change recent history on the Niagara Falls Bridge Commission's three crossings this summer. Canadian humanitarians ask, Is U.S. still safe for refugees? Several aid organizations and pro-immigrant groups are pressuring the Canadian government to pull out of a controversial program which turns away almost all refugees coming in through the United States. A consumer advocate group has issued a warning about New Leaf Travel, a low-cost airline based in Winnipeg. The discount carrier flies out of eleven mid-sized Canadian cities, including Hamilton, but it continues to run into problems. Toronto police will not march in this year's Pride Parade, one of the biggest events in North America. The police chief, Mark Saunders, says he knows the LGBTQ community is divided and his decision will enable those differences to be addressed. Garbage collection and disposal for a large area of Toronto will remain in union hands. The city's mayor had been advocating for it to be turned over to the private sector, but he has basically shelved the idea, for now. The city of Toronto is moving to address an opioid crisis that is crossing Canada. In the United States, it has already been described as the greatest drug crisis in American history, fueled by opioids like fentanyl. Across the continent, thousands of people are dying from overdoses. Recently in Vancouver, the city had the equivalent of nearly 130 overdose deaths in one month, the equivalent of four a day. That prompted the city's mayor to issue a warning to his counterpart in Toronto. Two suspects have been charged after police say a dog was dragged by a car for nearly a half-mile in Welland, ON. The controversial immigration executive order signed Friday by President Trump does more than ban visitors from some Muslim-majority countries. It also requires a new tracking system for every traveler, including U.S. citizens, that could cause the Peace Bridge and local economy to suffer. Canadian Prime Minister Justin Trudeau suggests his nation's peacekeeping decisions will be made with the Trump administration's particular world view in mind. New figures show that the real estate market in Toronto and its surrounding areas continues to climb rapidly, making it the hottest in North America. Toronto has enjoyed a housing boom for several years, with no end in sight. Now, communities outside the city are starting to feel the effects as Toronto buyers look farther afield for affordable housing. Canada recently took the long-awaited step of banning asbestos products. The ban will go into effect by 2018 and critics say it's long overdue. Police in the Toronto area are employing a new tactic in what has so far been a losing fight against distracted driving. WBFO Canada Correspondent Dan Karpenchuk reports their new method of outwitting texting drivers who are on the lookout for police is proving to be extremely effective. A complaint that led Ontario's animal welfare agency to investigate Marineland accuses the tourist attraction of cruelty against several species. For years, some have argued that New York State's convenience stores are at a disadvantage when it comes to cigarette sales because Native American shops need not charge the same taxes as non-Natives are required to do. Across the border in Ontario, a convenience store advocate says their problem with "contraband cigarettes" is similar, skyrocketing and will only get worse. With the Trump Administration likely to push for Public-Private Partnerships for its trillion-dollar infrastructure plans, around 1,200 people are gathered in Toronto starting Monday for a conference on those partnerships and how they have worked around the world. Will disillusioned U.S. voters really move to Canada? The election of Donald Trump has some Americans looking north, perhaps to make a new home in a country removed from Trump's style of Republicanism. Many said jokingly if Trump were elected, they would move to Canada. For some, it's no longer a joke. But moving north might not be so easy. Canada now has a new trade deal with the European Union that can hurt American companies trying to compete in Europe. Real estate prices in the Toronto and Vancouver areas have skyrocketed to such an extent that the Canadian government has raised concerns. In Vancouver, the British Columbia government has imposed a tax on foreign buyers. The Bank of Canada is also concerned about the overheated real estate markets. One sector that's been feeling the pressure for a couple of years is golf courses.